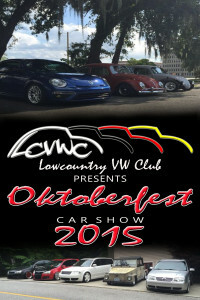 Lowcountry Volkswagen Club and JK Automotive present the 23rd annual Oktoberfest Car show. All water cooled and air cooled welcomed, if it’s a VW or Audi, bring it! Fun filled family event, cars, food, and raffle. All proceeds donated to Pet Helpers of Charleston. Food and drinks on site from 11:00 a.m. to 2:00 p.m.